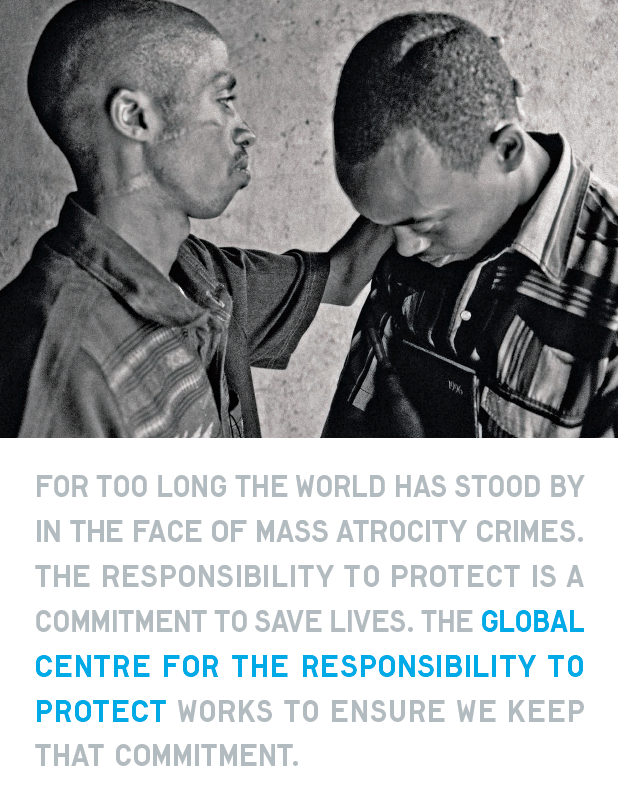 The Global Centre for the Responsibility to Protect was established in February 2008 to promote universal acceptance and effective operational implementation of the norm of the "Responsibility to Protect" populations from genocide, war crimes, ethnic cleansing and crimes against humanity. Through its programs, events and publications, the Global Centre serves as a resource and a forum for governments, international institutions and non-governmental organizations working to protect populations from mass atrocities. The Global Centre for the Responsibility to Protect seeks to transform the principle of the Responsibility to Protect into a practical guide for action in the face of mass atrocities. The Global Centre was founded by a number of supportive governments, leading figures from the human rights community, as well as by International Crisis Group, Human Rights Watch, Oxfam International, Refugees International, and WFM-Institute for Global Policy. The Global Centre engages in advocacy around specific crises, conducts research designed to further understanding of R2P, recommends strategies to help states build capacity, and works closely with NGOs, governments and regional bodies which are seeking to operationalize the Responsibility to Protect. The Global Centre has offices in New York and Geneva. Dr. Simon Adams has served as Executive Director of the Global Centre for the Responsibility to Protect since 2011. Dr. Adams has worked extensively with civil society organizations in South Africa, East Timor, Rwanda, and elsewhere. Between 1994 and 2002 Dr. Adams worked with Sinn Féin and former IRA prisoners in support of the Northern Ireland peace process. He is also a former anti-apartheid activist and former member of the African National Congress of South Africa. Dr. Adams is the author of four books on international conflict. He has also written for the New York Times and appeared as an expert commentator on Al-Jazeera, BBC and numerous other media regarding issues of mass atrocity prevention and international justice. Dr. Adams has spoken at the Canadian, German, UK and European parliaments, and is regularly invited to address high-level meetings at the United Nations. Dr. Adams has also held senior appointments at various universities, including as Pro Vice Chancellor (International Engagement) at Monash University, and as Vice President of its South African campus between 2008-2010. Among his other commitments, Dr. Adams is also currently a member of the board of Catalpa International, an East Timorese not-for-profit information technology and development organization. He is also Co-Chair of the International Advisory Board of Skateistan, an award-winning non-profit organization dedicated to using skateboarding to expose Afghan, Cambodian and South African children to sport, education and leadership development opportunities. Skateistan was rated one of the top 100 most influential and innovative NGOs in the world during 2017. For inquiries regarding Dr. Adams' availability, please send a request to info@globalr2p.org. Savita Pawnday is the Deputy Executive Director of the Global Centre for the Responsibility to Protect. Ms. Pawnday oversees Global Centre's programming in New York and Geneva, and leads on developing innovative institutional mechanisms and capacities needed to prevent mass atrocities both at national and international level. In 2010, Ms. Pawnday was instrumental in launching the Global Network of R2P Focal Points. With over 60 countries, the Global Network of R2P Focal Points is the largest network of senior government officials of its kind. Currently, Ms. Pawnday is involved in leading Global Centre engagement with UN Peacekeeping and in identifying strategies, including training, on how to enhance protection capacities of peacekeepers on the ground. Prior to joining the Global Centre for the Responsibility to Protect Ms. Pawnday worked in various capacities as a researcher and a project manager. She has worked in Zimbabwe, Zambia and Malawi with Catholic Relief Services, in New York with Trickle Up and in India with a few grass roots NGOs. She holds a M.A. from Fordham University in political economy and development, with a specialization in political economy of civil wars and a B.A. in Economics from St. Xavier's College, University of Mumbai. Jaclyn Streitfeld-Hall is the Publications Director for the Global Centre for the Responsibility to Protect. In this role she has editorial oversight for the R2P Monitor and all of the Global Centre's major publications. She also does research on populations at risk of mass atrocities in West Africa and Central Africa, including the Democratic Republic of the Congo, and is a primary contributor to the Global Centre's work on Peacekeeping and Civilian Protection. Prior to joining the Global Centre for the Responsibility to Protect, she was a Research Assistant at the Cline Center for Democracy and taught International Relations and Comparative Politics courses at the University of Illinois at Urbana Champaign. She received a B.A. in Political Science and English from the University of Maryland, Baltimore County and an M.A. in Political Science with a specialization in International Relations from the University of Illinois. Nadira Khudayberdieva is a Program Manager at the Global Centre for the Responsibility to Protect, where she leads the Global Centre's work on the Global Network of R2P Focal Points – a network of senior government officials appointed to promote R2P and mass atrocity prevention at national, regional and international levels. Nadira also conducts research and advocacy at the United Nations on populations at risk of mass atrocities, with the current focus on the situations in Myanmar (Burma), Nigeria and Democratic People's Republic of Korea. In addition, Nadira is involved in other projects of the Global Centre, including R2P and Protection of Cultural Heritage. Nadira holds an MSc in Global Governance and Diplomacy from the University of Oxford, and a B.A. in International Studies from Earlham College. Previously, she worked at the Quaker United Nations Office. Nadira is fluent in English and Russian and has a working knowledge of Spanish. Sarah conducts research on populations at risk of mass atrocities, focusing on Egypt, Eritrea, Somalia, Libya and the Philippines. She is also the digital media expert, responsible for graphics and the Global Centre's social media accounts. Sarah holds an MA in Diplomacy and International Relations from Seton Hall University, where she concentrated on Human Rights Law and Sub-Saharan Africa. She also holds a BS in Diplomacy and International Relations from Seton Hall University, where her focus was Russian and Eastern European Studies and Modern Languages (Russian and French). Juliette Pauuwe is a Research Analyst at the Global Centre. She conducts research on and advocates for populations at risk of mass atrocities, focusing on Cameroon, Nigeria, Sudan and South Sudan. She leads the Global Centre's work on Group of Friends of R2P in New York and is involved in the Centre's work on UN peacekeeping, Protection of Civilians and international justice. Juliette also coordinates the internship program at the Global Centre. She holds a BA and MA in Cultural Anthropology and Development Sociology from Leiden University, a BSc in Political Science from VU University Amsterdam and an MSc in International Security and Law from the University of Southern Denmark. Prior to joining the Global Centre she interned and worked for the Dutch Ministry of Foreign Affairs and the International Criminal Court. She is fluent in Dutch and English and has intermediate knowledge of French, German and Danish. Elisabeth is working as a Research Analyst at the Global Centre's office in Geneva, where she is conducting research on populations at risk of mass atrocities in Burundi, Venezuela and Nicaragua and is focusing on building better linkages between the work of the Human Rights Council (HRC) and the implementation of R2P. She holds an LLM in International Humanitarian Law from the Geneva Academy of International Humanitarian Law and Human Rights, a MA in Humanitarian Action from Sciences Po, Paris and a BA in Development Studies from the School of Oriental and African Studies (SOAS) and King's College London. Prior to joining the Centre, Elisabeth has gained work and research experience in the human rights sector in Brazil, India and the United Kingdom. Fluent in English, German and French, she has basic knowledge of Spanish and Portuguese. Shilpa conducts research on populations at risk of mass atrocities in Afghanistan, Iraq, Israel and the Occupied Palestinian Territories, Syria and Yemen. She supports the organization's thematic programs and development activities. Shilpa joins the Global Centre having most recently worked as a Campaigns and Research Assistant for Crisis Action, where she focused on their Syria, Yemen, and South Sudan campaigns. She has previously interned at Physicians for Human Rights and Doctors Without Borders. Shilpa holds a B.S. in Global Public Health and Media, Culture, and Communications, with a minor in Political Science from New York University. Eli Karetny manages the Global Centre's grants and financial accounts. After receiving a JD/MBA from Temple University, Eli joined the Peace Corps and served in Ukraine, which is where his parents are from. Eli has an MA in International Relations from New York University and is currently a PhD candidate in Political Science at the CUNY Graduate Center, writing his dissertation on the counter-revolutionary conceptions of freedom and philosophy in the work of Leo Strauss. He teaches political theory and international relations at Baruch College-CUNY. Jenna is currently serving as a research assistant and consultant to the Global Centre, focusing on UN peacekeeping. Jenna is a PhD student at the Graduate Center, majoring in International Relations and minoring in Comparative Politics, with a focus on peacebuilding. Prior to her time at the Graduate Center, Jenna worked as a consultant to the UN Department of Peacekeeping Operations in the Disarmament, Demobilization and Reintegration Section, as well as the DPKO/DFS Integrated Training Service. Her other areas of research include peacekeeping in the Great Lakes region of Africa, with a special focus on the Democratic Republic of the Congo, Rwanda, and the LRA. Jenna holds an M.A. in International Relations from the City College of New York and a B.A. in Music and Education from Seattle Pacific University. Johanna is an intern at the Global Centre. Prior to joining the Centre, Johanna worked as a Project Assistant at the Munich Security Conference. She holds a MA in Political Science from the Bavarian School of Public Policy and an LLM in International Human Rights Law from The City Law School, University of London. She wrote her first dissertation about the US-led airstrikes in September 2014 against the Islamic State in Syria from an international law perspective and the second one about the United States and military intervention for humanitarian purposes. Johanna's primary area of interest is the Law of War and International Criminal Law. She is fluent in German and English and has intermediate knowledge of Spanish and basic knowledge of Latin and Ancient Greek. May is currently an intern with the Global Centre for R2P. Prior to joining the Global Centre she worked as a Case Analyst in the field of immigration law, after graduating from McGill University with a B.A. in Political Science, Anthropology, and World Islamic and Middle East studies. May's primary areas of interest lie in studying the root causes of modern extremist ideology, the use of technology in human rights, and the international refugee regime. She is bilingual in English and French, and conversational in Spanish. The distinguished International Advisory Board provides advice on strategy, policy and management. Its members include policymakers, diplomats and academics, as well as leaders from the international human rights community. Hon. Gareth Evans AO QC is Chancellor of the Australian National University and Honorary Professorial Fellow at The University of Melbourne. He serves as Co-Chair of the International Commission on Nuclear Non-Proliferation and Disarmament, and is President Emeritus of the International Crisis Group which he led from 2000 to 2009. He previously spent 21 years in Australian politics — thirteen of them as a Cabinet Minister — including eight years as Foreign Minister (1988-96). He has written or edited nine books — most recently The Responsibility to Protect: Ending Mass Atrocity Crimes Once and for All (2008). Gareth Evans has served on numerous blue ribbon panels, including the International Commission on Intervention and State Sovereignty (2001) famous for creating the principle of the responsibility to protect, and the UN Secretary General's High Level Panel on Threats, Challenges and Change (2004). He is the recipient of the 2010 Four Freedoms Award for Freedom from Fear, granted by the Franklin and Eleanor Roosevelt Institute/Roosevelt Stichting for his pioneering work on the Responsibility to Protect, and his contributions to conflict prevention and resolution, arms control and disarmament. Mohamed Sahnoun was the founder and chair of the Caux Forum for Human Security, and former President of Initiatives of Change-International. He has a distinguished diplomatic career, serving as Deputy Secretary-General of both the Organization of African Unity and the League of Arab States, and as Algeria's Ambassador to Morocco, the United States, France, and Germany. Mr. Sahnoun has represented the United Nations in numerous positions since 1992, and is currently a Special Adviser to the Secretary-General. He was Co-Chair of the International Commission on Intervention and State Sovereignty (ICISS). Mohamed Sahnoun passed away during September 2018, but remained a committed member of the IAB through the end of his life. His Excellency Francis Deng served as the Permanent Representative of South Sudan to the United Nations from 2012 - 2016. Mr. Deng completed his five-year term of office as Special Adviser to the UN Secretary-General on the Prevention of Genocide on 31 July 2012. From 2006 to 2007, Mr. Deng served as Director of the Sudan Peace Support Project based at the United States Institute of Peace. He was also a Wilhelm Fellow at the Center for International Studies of the Massachusetts Institute of Technology (MIT) and a Research Professor of International Politics, Law and Society at Johns Hopkins University Paul H. Nitze School of Advanced International Studies. Before joining MIT, Mr. Deng was a Distinguished Visiting Scholar at the John Kluge Center of the Library of Congress. Mr. Deng served as Representative of the United Nations Secretary-General on Internally Displaced Persons from 1992 to 2004, and from 2002 to 2003 was also a Senior Fellow at the U.S. Institute of Peace. Mr. Deng served as Human Rights Officer in the UN secretariat from 1967 to 1972 and as the Ambassador of Sudan to Canada, Denmark, Finland, Norway, Sweden and the United States. He also served as Sudan's Minister of State for Foreign Affairs. Dr. Edward C. Luck is currently the Arnold A. Salzman Professor of Professional Practice in International and Public Affairs; Director, Specialization in International Conflict Resolution; School of International and Public Affairs, Columbia University. A highly regarded United Nations official since 2008, Dr. Luck served as the Assistant Secretary-General and Special Adviser to United Nations Secretary-General Ban Ki-moon. In this role, he has been responsible for the conceptual, political and institutional/operational development of the Responsibility to Protect doctrine, a plan to galvazine national and international action to prevent atrocity crimes and their incitement. From 2007 to 2011, Dr. Luck was at the International Peace Institute, an independent policy research institute, where he began as a Visiting Senior Fellow and left as the Senior Vice President, Research and Programs. His Excellency Frank Majoor is the Permanent Representative of the Netherlands on the North Atlantic Council. From 2005-2009 he served as the Permanent Representative of the Netherlands to the United Nations in New York. He was the Secretary General of the Netherlands Ministry of Foreign Affairs in The Hague between 2000 and 2005. From 1999 until 2000 he was Ambassador at Large in the Ministry of Foreign Affairs. Ambassador Majoor was appointed as the Permanent Representative of the Netherlands to the Conference on Disarmament in Geneva, Switzerland from 1997-1999. Ambassador Majoor started his career at the Ministry of Foreign Affairs in 1976, his long career at the Ministry has also has also included positions as Deputy Director and Director of the Security Policy Department. Edward Mortimer is Senior Vice-President and Chief Program Officer at the Salzburg Global Seminar. From 1998 to 2006 he served as chief speechwriter and (from 2001) as director of communications to UN Secretary-General Kofi Annan. He has spent much of his career as a journalist, first with The Times of London, and later with the Financial Times. He has also served as a fellow and/or faculty at several institutions, including Oxford University, the Carnegie Endowment for International Peace and the International Institute of Strategic Studies, among others; and on the governing bodies of several non-governmental organizations, including Chatham House, the Institute of War and Peace Reporting, and Minority Rights Group International. Mr. Mortimer received an M.A. in modern history from Oxford University. His writings include: "People, Nation, State: The Meaning of Ethnicity and Nationalism" (co-edited with R. Fine 1999), "The World that FDR Built" (1989), "Faith and Power: "The Politics of Islam" (1982). In the UK's 2010 New Year Honours he was awarded a CMG for services to international communications and journalism. Randy Newcomb is President and CEO of Humanity United, a foundation dedicated to building peace and advancing human freedom. Previously, Mr. Newcomb was a Vice President of Omidyar Network, and he served for 14 years as Executive Director of Golden Gate Community Inc. Mr. Newcomb was a Fellow at the Center for Social Innovation at Stanford University and an International Development Fellow at the University of Bath, England. He holds a Doctor of Education from the University of San Francisco and a Master of Science degree in development economics from the University of Bath. His Excellency Gert Rosenthal is currently the Chair of the Advisory Group of Experts on the Review of the UN Peacebuilding Architecture. He served as Guatemala's Permanent Representative to the UN from 1998 to 2014. Prior to taking up that position, he served on the Follow-up Commission of the Guatemalan Peace Accords. From 1988 to 1997, he was Executive Secretary of the Economic Commission for Latin America and the Caribbean (ECLAC). He joined that United Nations regional commission in 1974 as Director of its Mexico office, and in 1987 was appointed its Deputy Executive Secretary. Mr. Rosenthal held various positions in Guatemala's national public administration since joining its Secretariat of Economic Planning in 1960. From 1969 to 1971, and again in 1973 through 1974 he was Minister of Planning. Between 1969 and 1970, he was the Secretary-General of his country's National Council for Economic Planning. Darian Swig is the President of Article 3 Advisors, a consulting practice that works at the nexus of human rights and strategic philanthropy. Prior to 2001, Darian worked for over a decade in the field of international protocol and consular corps relations. Darian currently serves on the International Board of Human Rights Watch (HRW) and is on the advisory boards of the Carr Center for Human Rights Policy at Harvard University, the Human Rights Center at the University of California and the HRW Africa Advisory Committee. She is Chair of the HRW Northern California Committee and also serves as a member of the Pacific Council on International Policy, International Human Rights Funders Group, Global Philanthropy Forum, Clinton Global Initiative and The Philanthropy Workshop West. Darian is a past trustee of the World Affairs Council, Commonwealth Club, USA for UNHCR (the UN Refugee Agency) and a founding board member of Genocide Intervention Network. Darian holds dual Masters degrees in Political Science and International Area Studies with an emphasis on human rights policy and mass atrocity crimes from the University of California at Berkeley. Dr. John Torpey is Professor of Sociology and History at the Graduate Center, City University of New York, and Director of the Ralph Bunche Institute for International Studies at the Graduate Center. He is the author or editor of eight books: Intellectuals, Socialism, and Dissent: The East German Opposition and its Legacy (1995); The Invention of the Passport: Surveillance, Citizenship, and the State (2000); Documenting Individual Identity: The Development of State Practices in the Modern World (edited with Jane Caplan; Princeton: Princeton UP, 2001); Politics and the Past: On Repairing Historical Injustices (2004); Old Europe, New Europe, Core Europe: Transatlantic Relations after the Iraq War (2005), Making Whole What Has Been Smashed: On Reparations Politics (2006); The Post-Secular in Question (2012); and, with Christian Joppke, Legal Integration of Islam: A Transatlantic Comparison (2013). He is on the editorial board of Theory and Society and the Journal of Human Rights, and edits a series for Temple University Press titled "Politics, History, and Social Change." Dr. Jennifer M. Welsh is Professor and Chair in International Relations at the European University Institute and a Fellow of Somerville College, University of Oxford. She was previously a Professor in International Relations at the University of Oxford, and co-director of the Oxford Institute for Ethics, Law and Armed Conflict. In 2013, she was appointed by the UN Secretary General to serve as his Special Adviser on the Responsibility to Protect, a position she held until March 2016. Professor Welsh is a former Jean Monnet Fellow of the European University Institute, and a Cadieux Research Fellow in the Policy Planning Staff of the Canadian Department of Foreign Affairs. She is the author, co-author, and editor of several books and articles on humanitarian intervention, the evolution of the notion of the 'responsibility to protect' in international society, the UN Security Council, and Canadian foreign policy. She was the Distinguished Visiting Fellow at Massey College (University of Toronto) in 2005, and a 2006 recipient of a Leverhulme Trust Research Fellowship and a Trudeau Fellowship. In 2014, she began directing a five-year ERC-funded project on the 'Individualization of War'. Professor Welsh sits on the editorial boards of the journals Global Responsibility to Protect and Ethics and International Affairs, on the steering committee of the American Academy of Arts and Sciences project on Ethics, Technology and War, and on the Advisory Board of the Peace Research Institute in Frankfurt. She has a BA from the University of Saskatchewan (Canada), and a Masters and Doctorate from the University of Oxford (where she studied as a Rhodes Scholar). Kofi A. Annan was the seventh Secretary-General of the United Nations, serving two terms from 1 January 1997 to 31 December 2006 and was the first to emerge from the ranks of United Nations staff. In 2001 Kofi Annan and the United Nations were jointly awarded the Nobel Prize for Peace. From February through August 2012 he was the UN-Arab League envoy to Syria. Lloyd Axworthy is President and Vice Chancellor of the University of Winnipeg. He served for twenty-one years as a member of parliament, including as Canada's Foreign Minister from 1995 to 2000. At the end of this term, Canada launched ICISS. He also worked to advance the human security concept, in particular, the global treaty banning anti-personnel landmines. LGen The Honourable Roméo A. Dallaire, (Ret'd), Senator, has had a distinguished career in the Canadian military, achieving the rank of Lieutenant-General and becoming Assistant Deputy Minister (Human Resources) in the Department of National Defence in 1998. In 1994, General Dallaire commanded the United Nations Assistance Mission for Rwanda (UNAMIR). He is a senior fellow at the Montreal Institute for Genocide and Human Rights Studies at Concordia University and author of "Shake Hands with the Devil: The Failure of Humanity in Rwanda." Jan Eliasson is currently the Deputy Secretary-General of the United Nations. He previously served as the president of the United Nations General Assembly and served as foreign minister of Sweden (2006), state secretary for foreign affairs (1994-2000), and Sweden's ambassador to the United Nations. He is also formerly the United Nations Secretary-General's special envoy for Darfur. Lee Hamilton is the director of The Center on Congress at Indiana University. He served as president and director of the Woodrow Wilson International Center for Scholars from 1999 through 2010. Before then he served in the House of Representatives for 34 years, and served as co-chair of the Iraq Study Group and vice-chair of the 9/11 Commission. He was a member of ICISS. David Hamburg served as the eleventh president of the Carnegie Corporation of New York (1982-1997). Hamburg was a founder and co-chair of the Carnegie Commission on Preventing Deadly Conflict, and the founder of the Carnegie Commission on Science, Technology and Government. Prince Hassan, brother of the late King Hussein, served as Crown Prince of Jordan from 1965-1999. He is president of the Club of Rome, chair of the Independent Bureau for Humanitarian Issues, and member of the Board of Trustees of the International Crisis Group. He served as co-chair of the Independent Commission on International Humanitarian Issues (1983-1987). Sadako Ogata was president of the Japan International Cooperation Agency and was UN High Commissioner for Refugees (1991-2000). She was chairman of the Executive Board of UNICEF and minister plenipotentiary at the Japanese Permanent Mission. From 1982 to 1985 she represented Japan on the UN Commission on Human Rights. She was co-chair of the Commission on Human Security (2002-2003). Fidel V. Ramos was president of the Philippines (1992-1998). Previously, he served as Chief of Staff of the Armed Forces of the Philippines and later as Secretary of National Defense in the administration of President Corazon Aquino. He is the founder and chairman of The Ramos Peace and Development Foundation. Mary Robinson is the founder and served as a chair of Realizing Rights: the Ethical Globalization Initiative. She is also a member of The Elders. She is the former President of Ireland (1990-1997) and has served as the United Nations High Commissioner for Human Rights (1997-2002). Desmond Tutu is a founder, along with Nelson Mandela and Graça Machel, of The Elders. He served as chair of the South African Truth and Reconciliation Commission, and was awarded the Nobel Prize for Peace in 1984. Since 2007, the Global Centre has received generous financial support from various parties. To donate and help support the work of the Global Centre please contact Savita Pawnday.